The larger-than-life figure that teased and tormented the Sacramento Kings for so long is now the biggest name to join the franchise’s new ownership group. 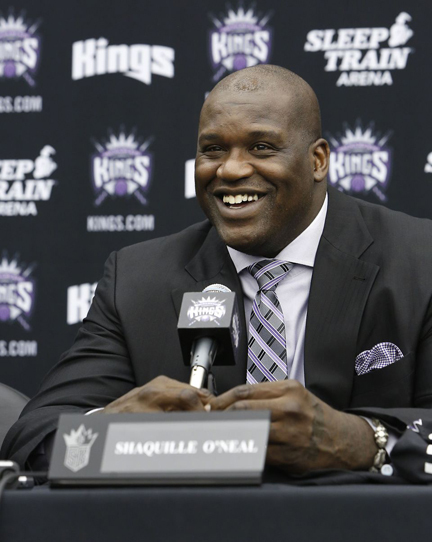 The Kings announced Monday that Shaquille O’Neal has acquired a minority stake in the team under new owner Vivek Ranadive. The Kings will introduce the four-time NBA champion at a news conference Tuesday in Sacramento. During the height of his career with the Los Angeles Lakers, O’Neal fueled the rivalry with the Kings with his play on the court and his personality off of it. O’Neal handed Sacramento its biggest blow by rallying the Lakers from a 3-2 deficit to win the 2002 Western Conference finals, which is still a sore spot for Kings fans. The 7-foot-1 center even labeled the franchise the “Sacramento Queens” and accused fan favorite Vlade Divac — whom he referred to as “she” at one point — of flopping. O’Neal was a 15-time All-Star and the 2000 NBA MVP. He played for the Orlando Magic, Los Angeles Lakers, Miami Heat, Phoenix Suns and Cleveland Cavaliers before retiring after the 2010-11 season with the Boston Celtics. O’Neal, now 41, has worked as an analyst for TNT the last two seasons. O’Neal is the latest high-profile former player to join the Kings this summer after the franchise nearly moved to Seattle. Hall of Famer Chris Mullin was hired as a consultant to Ranadive — who bought the franchise from the Maloof family in May — and Mitch Richmond is part of the ownership group. The group includes 24 Hour Fitness founder Mark Mastrov, who is friends with O’Neal. The two partnered in the past to build several gyms, especially in South Florida during O’Neal’s time with the Heat.